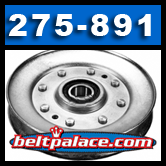 Home > Lawn and Garden > Lawn Mower Idler Pulleys > Idler Pulleys for your John Deere Mower > Stens 275-891. 5 inch dia. V-Idler Pulley. Replaces JOHN DEERE AM136357 and Others. 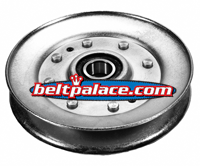 Replacement IDLER PULLEY for JOHN DEERE AM136357, Known to Fit Model(s): JOHN DEERE X300 and X304. 5 inch Diameter. Choose bore of 5/8 inch.